a long time ago i made an attempt at fair isle knitting that did not go well. i knitted as much as a whole sleeve, but since i hadn’t grasped the technique, the result was poor and what was worse was that i had chosen yarn that did not go very well together. oh, there was nothing wrong with the colours, but even though they were both 3-ply wool yarn from the same manufacturer, one of them was significantly thicker than the other. i’ve cast on for this project probably four of five times but i was never satisfied. 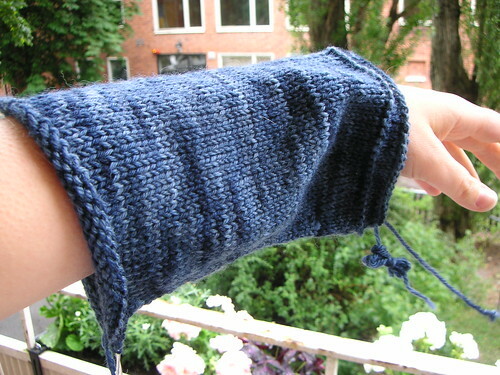 i didn’t want to give up on this project, though, i think it might turn into a beautiful jumper in the end. and the intended recipient keeps wondering if will ever receive a jumper knit by me. well, i really hope he does. i’ve replaced the white yarn with something that actually works. the grey yarn is kampes 3-ply and the charcoal is yllets 3-ply. there is hope for the old jumper yet. for all of you swedish knitters out there: there is a new knitting community called stickning. check it out and join up! get a chance to discuss knitting with other knitters and browse photos or add you own. i want to thank everyone for your nice comments about my new blog home. however, i cannot take credit for the nice layout, it’s a ready-made template that i’ve chosen. i plan to change the header to one of my own photos eventually. i recieved some comments about the afternoon tea. elena: i cannot take credit for the tea cosy, it was a gift, but i do agree; it’s wonderful and i love it! lucy: yes, there’s butter on the scones! about the cheese: it’s two types of very common swedish cheese (cheese = ost in swedish), prästost and grevé i think. 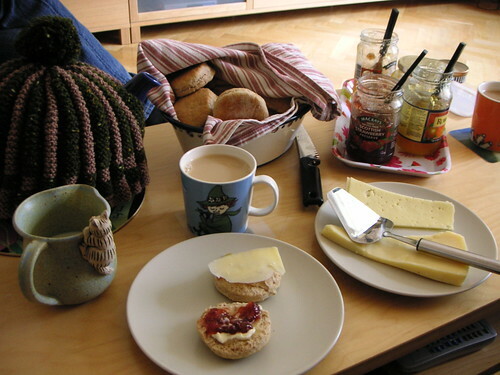 having scones and tea is fairly common in sweden, i don’t know about the rest of scandinavia though. but we usually make the scones into larger round “cakes” that we cut into quarters and then divide them in the middle. i prefer to make them into small buns, using a glass to “stamp” them out of the dough. the first sleeve of my hourglass sweater is almost finished, but i didn’t want to bother with a new photo yet, progress photos aren’t always that exciting… but it’s still very enjoyable to knit and the yarn is just wonderful to knit with. i can highly recommend it. not only did i knit this weekend, i couldn’t keep myself from the larder again, and made some scones. yesterday we had afternoon tea and watched foyle’s war and listened to the pouring rain. this weekend hasn’t yielded very summery weather, it’s been raining on and off since friday. but it doe sn’t bother me much, i’ve had loads of time spent knitting. and i’ve always loved rain. i decided to knit the sleeves in the round with two circulars instead of dpns, but i’m not convinced it’s a better method. it’s slower. and i really don’t mind knitting with dpns, actually i rather enjoy it. but since i’ve used two circulars so far, i better stick with them for both sleeves so there will be no changes in my gauge. the sleeve is a bit loose, but i suppose that makes it more comfortable. and they’re supposed to be a bit flared. sometimes when i see a pattern or a yarn i just can’t restrain myself, i just have to cast on and start knitting right away. then there are other patterns and yarns that i want to ponder. this is one of them. i bought the beautiful book “last minute knitted gifts” by joelle hoverson in 2004 and there are many things in i want to have a go at. especially that lovely, flattering hourglass sweater. however, the pattern calls for noro cash iroha, which is not only expensive but also sometimes hard to come by here in sweden unless you buy it from an online shop (i know that there are some shops, nysta e.g. that sometimes carries it). and i have had at a squeeze at it and i must say, i wasn’t that impressed. it took me a while to figure out what yarn to use, but when i remembered that i received a gift certificate at nysta at my birthday in 2006, i decided to buy the yarn for this particular jumper. i had been ogling and fondling araucania’s nature wool for some time, but really didn’t know what to do with it. until now. well, what can i say, it was a perfect match. i used up my gift certificate in january and wound up all that lovely yarn into balls. i was busy with other knitting projects, and put the yarn away, but that was perfectly alright; i knew what to do with it once i was ready. i didn’t expect i would want to start knitting a thick wooly jumper in the middle of summer, but there it is. nature wool is very soft and completely heavenly compared to the bamboo tape yarn i’ve been knitting with recently. i love how the colours change with every new stitch. i am very pleased with the result so far, and i’ve tried it on several times and it seems to fit perfectly. i know that many people haven’t been satisfied with the decreases in the yoke, and i’m ready to do some modifications once i get there. there are many beautiful versions of this jumper out there and one of my favourites is satoko’s. i hope mine will be as lovely. saturday’s rain kept me inside. it was a perfect day for pottering about. I was in a baking mood. isn’t the smell of freshly baked bread wonderful?